What did Christmas decorations look like in Buffalo circa 1901? You can get a glimpse when you tour the Theodore Roosevelt Inaugural Site, 641 Delaware Ave., between North and Allen Streets, Buffalo. Garden clubs from the Eighth District Federated Garden Clubs of New York State have decorated the historical site for the holidays. Last week, we told you that the garden clubs were challenged to use a color scheme of silver, burgundy and pink. At the same time, they aimed to keep true to the styles that were in vogue at the turn of the last century, when Theodore Roosevelt took the presidential oath of office at the site. On 1901, the mansion was the home of Ansley Wilcox, a friend of Roosevelt. In general, decorating in the Victorian era was lavish, abundant and profuse. 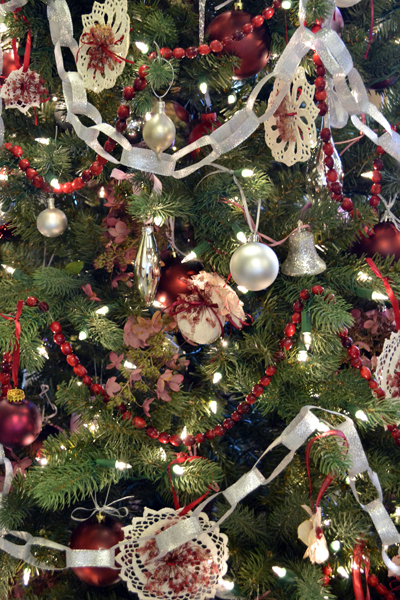 The liberal use of decorative items is demonstrated in the close-up at left of a Christmas tree decorated by the Ken-Sheriton Garden Club. Buffalo newspapers of the Victorian period the time carried detailed accounts of the holiday parties and debutante balls thrown by wealthy Buffalo residents at Christmastime. Natural materials– not just evergreens, but fresh flowers, too– were used in decorating, said Lenora M. Henson, curator at the Theodore Roosevelt Inaugural Site. “The people whose parties made the papers were Buffalo’s elite, so they must have had access to greenhouses,” she said. To simulate the style for an exhibit that lasts weeks rather than just a single night, the garden clubs generally use dried flowers in their creations. At right, an ornate mirror reflects the dried hydrangea arrangement and door wreaths made by the Lancaster Garden Club. At the turn of the century, Christmas decorations at high society parties included flowers we associate more strongly with Easter than with Christmas, such as hyacinths and lilies. Roses were mentioned often. Below left, the Smallwood Garden Club used pink roses in its decorations for the dining room. In a lovely coincidence, the painting of Frances Wilcox, daughter of Ansley and Mary Grace Wilcox, shows her also holding a pink rose. On the table is a silver epergne (an ornamental centerpiece designed to hold flowers). 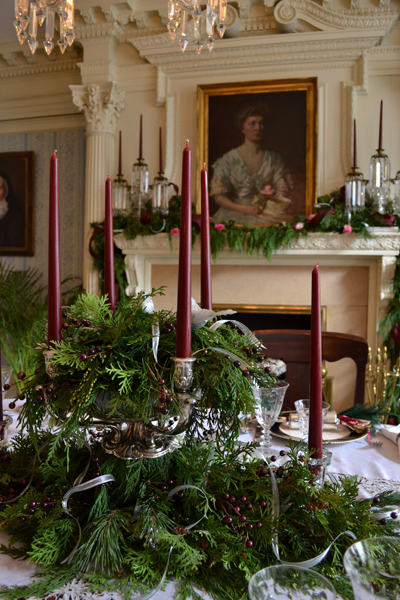 It was purchased in memory of Betty Nosbisch, who was the motivating force that developed the garden clubs’ role in the Victorian Christmas at the Inaugural Site. She chaired or co-chaired the gardeners’ decorations for 13 years and died last year at age 88. The epergne is meant to be used each year in the holiday decorations at the TR Inaugural Site. Swags are mentioned often in the newspaper accounts. A Dec. 22, 1897 article from the Buffalo Evening News described the decorations at a ball held by Mr. and Mrs. Frank H. Goodyear at the Twentieth Century Club that was attended by 400 to 500 people. According to the article, the ballroom was canopied with laurel roping, centering at the chandelier. The balcony pillars were wound with laurel, and a network of laurel roping ornamented the balcony railing. At a debutante ball in 1900, holly and smilax wound stair railings and door arches. Above is a swag created by the Willowridge Garden Club using greens, pine cones, silver bells and pink and burgundy ribbons. The swags match large wreaths hung in the windows. Dress forms with period gowns from the site’s costume collection accent the decorations. The decorations can be viewed until Friday, Dec. 30 at the Theodore Roosevelt Inaugural Site, 641 Delaware Ave., Buffalo. The museum may be visited by guided tour only. Tours are scheduled every hour on the half-hour, beginning at 9:30 a.m. weekdays and 12:30 p.m. weekends. The last tour is at 3:30 p.m. Group rates are available. The site will be closed on Christmas Eve, Christmas Day, New Year’s Eve and New Year’s Day. Dear Connie, thank you for the great coverage, of the Victorian Christmas decorations at the TR Site.I feel the Garden Clubs of 8th District did a marvelous job of recreating these Victorian Christmas decorations. I know they spent a great deal of time researching and creating.As 8th District Director and Co-Chair of Victorian Christmas, for the District,I greatly appreciate their efforts and urge all to visit the Site this month. The garden club members did a great job! There were so many restrictions in the theme, plus they had to make sure the decorations were true to the time period. I think all those restrictions help get the creative juices flowing. I know our readers will find inspiration for their own decorations when they visit the TR Inaugural Site. Thanks so much for taking on this project every year.